We absolutely love this vanity and mirror. The quality is wonderful of all including the vanity sinks and mirror. We got our own faucets and it was easy for them to match! Love it! 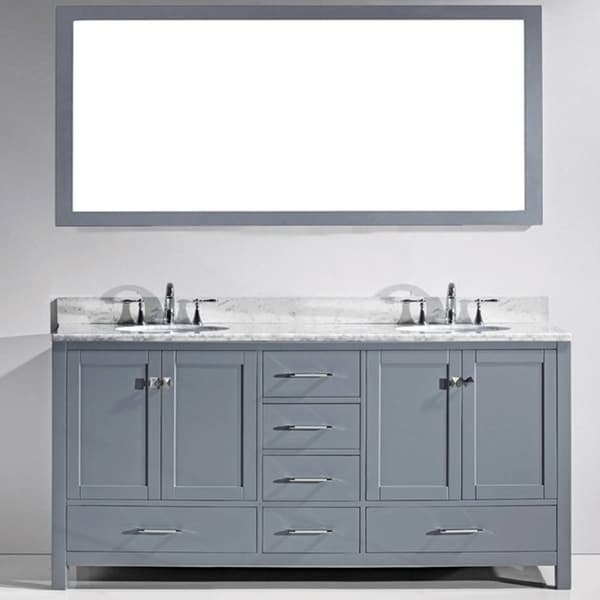 Clean lines, expert construction, and rugged materials coalesce in this sophisticated bathroom vanity set. The classic brushed nickel hardware is matched with solid wood and an Italian carrara white marble top for a durable and distinguished addition to any lavatory. We have had the vanity for a year and love it! The soft close doors are amazing! The gray cabinets fit perfectly with the gray and white theme of our bathroom. Our first vanity was mistakingly dropped off at the wrong house by the delivery service -- overstock customer service was phenomenal and after the delivery company couldn't correct the error sent out another vanity the next day. No delay in our project and vanity itself is very nice -- solid wood, modern cool gray color, marble vanity top is as described...looks great, very happy, good price. Ordered last summer (7 months) ago for a remodel. It's been installed for about 4 months now and is exactly the quality and look I expected and I am very critical. I also get loads of compliments. Great purchase! I did however buy during a sale period, it is higher now. I received this yesterday from a private shipping company. It was packed so well and absolutely no damage. The quality is great and exceeds all expectations. It is perfect for my bathroom and is constructed perfectly!!! It is just like the picture. Nice quality. Drawers are smooth and the color is a nice warmer gray. Only complaint is the knobs are brushed nickel and the handles are chrome. Lowest Price Found In My Search. I searched local stores and on line. This price saved me at least $. It was packed extremely well, heavy, but no chips, scratches or breaks. Arrived in 3 boxes to ensure no breakage. I hired an independent person to install as my husband was afraid to try. We had to call the phone number on the box for questions and the agents could not have been more helpful (Virtu Mfg). The quality of this vanity, sinks, marble countertops, and overall appearance exceeded our expectations. Thank you Overstock! This vanity is beautiful! We did have a problem with a cracked marble top on it though. We waited to long to open and install it so overstock did not send us a new top. I shopped everywhere for a vanity for our bathroom renovation. This vanity is beautiful. I do wish the marble countertop was a bit thicker. Beautiful vanity. It comes very well packed and was very easy to install for my contractor. Soft close doors and drawers are a great addition. This vanity is perfect for our decor. Lots of storage space and clean lines. It took me a long time to find a vanity for your bathroom remodel. I was a little skeptical making such a large purchase without seeing it in person first. However, this vanity is just as pictured. Both the color of the vanity itself and the marble are perfect. Quality Okay. I see the same brand in big box stores. "How deep are these sinks? How high can I make the rough in plumbing? How far are the sinks off center? are the sinks on center from the center?" "I have seen a few different dimensions for the countertop width. Can someone who has purchased tell me the exact countertop width please? Thanks!" "What are the spread of the holes in the counter? Can a single handle faucet be used, if so how big does the plate need to be to cover all three holes?" "Is the marble top a veneer or solid? Thanks!!" "I do not understand the finish options - Grey Finish, Round or Grey Finish, Square. Is this for the pulls? One of the pictures does not match the rest, showing shelves under the sinks. Which is it?" I believe they are talking about the edges of the top. it is probably to choose between round sinks or square sinks. "Also, is there an opening at the back of the cabinet to install faucet?" "Is the back splash carrara marble as well?" There are several creative ways to make the most out of your small vanity space, and with a few organizing tips, you can easily avoid the bathroom clutter trap.